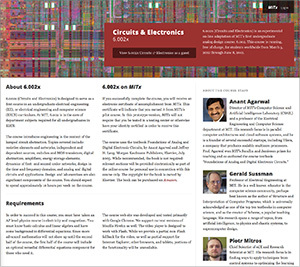 MIT's first MOOC, "6.002x Circuits and Electronics"
What happens when it's time for a MOOC to die? Starting this week the original course that thrust MIT into the annals of MOOC history will exist no longer — although an updated version will continue being available. In coverage by Class Central, a site that tracks massive open online courses, founder Dhawal Shah reported that edX would be retiring the platform that hosted MIT's first MOOC, "6.002x Circuits and Electronics." According to Class Central, the course, which launched on March 5, 2012, drew 155,000 learners from around the world. Students were "blown away" by its functionality, which included free, embedded course materials and a feature that would let users draw and simulate circuits within the browser. Now, five years later, edX will retire the platform and shut down the servers supporting it on March 15. The reason: security concerns. Members of that MOOC community recently received a letter explaining, "We care about the privacy of our students, and it is simply too cumbersome to maintain security on the original half-decade-old servers. Unfortunately, it has come time to retire the original MITx 6.002x." All 155,000 students have been shuttled to a new invitation-only instance of the course, giving them "continued access to the course materials" and a way to maintain their participation in the "private social community" made up of the "original MITx 6.002x pioneers." In the meantime, the course itself lives, though it has undergone considerable updating since its initial launch. Now, students can take Circuits and Electronics 1, 2 and 3, three courses available in a self-paced format.